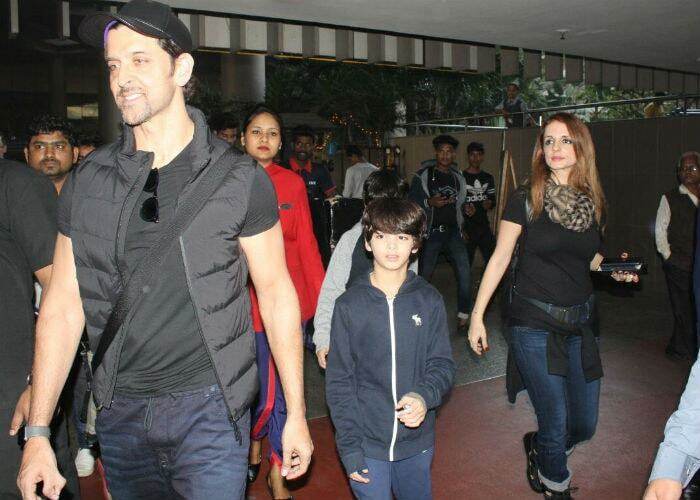 Hrithik Roshan's ex-wife Sussanne Khan has touched down in Mumbai with children - Hrehaan and Hridhaan, and was also spotted at the airport was the 43-year-old actor. Sussanne was vacationing in the snow-clad locales of France and literally filled up her Instagram with plenty of chill vibes. In several photos posted on Instagram, the designer can be seen hanging out with her sons, enjoying the French snow and experiencing her first ever blizzard but the part she seems most excited about is the ski sessions in the Rhone-Alpes. Sharing her experience, Sussanne posted a customary selfie from the ski camp and wrote: "Sometimes you discover a joy of life so big that u wonder how u didn't think to try before." She sure had a great vacation and with all that excitement about her French vacay, she made it snow on Instagram. Sussanne also wrapped the last day of the year with an adorable selfie from the snow-clad mountains. She carefully documented the many of her adventures on Instagram. First-time experiences are always special and this is what she wrote about the "winter fairyland": "My first Snow blizzard.. -8 degrees n dropping! Yet we have soooo much fun. Anywhere is amazing w My bestie Gayatri Oberoi (sic)." Sussanne's Cristmas memories also look like cute post-cards: "To the most amazing perfect Christmas Day of my life. So thankful for this glorious day," she wrote on Instagram. Vacation done, Sussanne and the children were spotted with Hrithik Roshan at the airport, though there was no sign of Hrithik in Sussanne's Instagram posts from France. Hrithik and Sussanne married in 2000 and were officially divorced in 2014. However, Hrithik and Sussanne continue to be in touch and are often spotted partying together or at the movies.